First Aid Level 2 Training in South Africa. Get A Free Quote Today! With First Aid Level 2 training, you learn all the theory connected to level 1. Level 2 is a massive leap in terms of information. In level 1, you will mostly consist of practical exercises. In First Aid Level 2, you are required to write a written exam on the theory behind the practical. 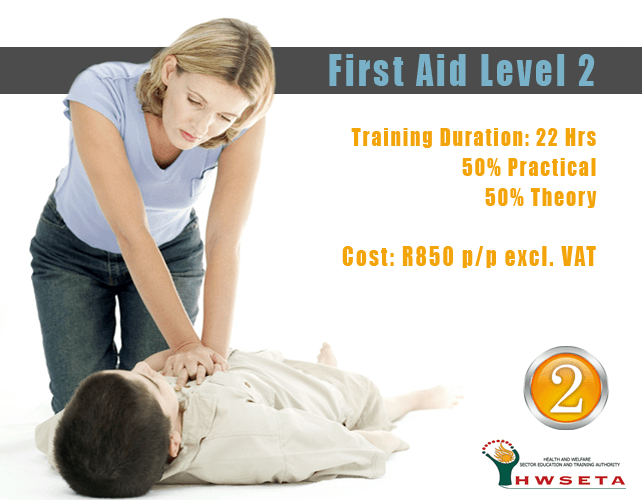 We usually recommend First Aid Level 2 if you are a new parent or nanny. This level included child and infant CPR. It’s very similar to adult CPR if you understand the theory behind it. There are some extra injuries included in level 2. This includes, for example, eye injuries, poisoning, bites, stings etc. this is also a great level if you have a hazardous work environment. First Aid Level 2 is not usually suggested unless you are interested in the field and would like to have as much knowledge as possible. The practical does not change much from level 1 to level 2. This essentially means that if you have level 1, you will be able to treat the same injuries. With level 2, you will just have a much better understanding of the treatments. In order to qualify for the level 2 course, you need to have a valid first aid level 1 certificate. Always remember that certificates are only valid for 2 years. If you do not have a first aid level 1 qualification yet, you can combine the two levels. We do offer discount if you combine levels. Principle of First Aid and Safety. Artificial respiration for adult, child and infant. To get a free quote for First Aid Level 2, feel free to complete our contact form anywhere on our website. We will get in touch as soon as possible. This course can be attended by both individuals and groups. This is also a great team building exercises. Unlike level 1, this course cannot be attended by illiterate students. This is a great starting point if you want to make first aid a career.